I’m so excited to share this with you today!! I’ve been working on these projects for days, and just haven’t been able to get them finished up. 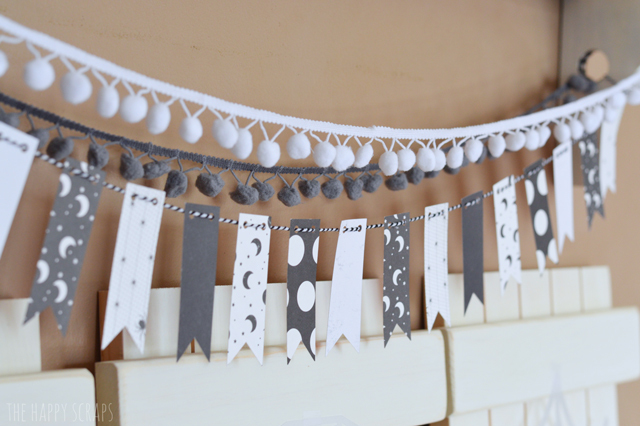 Today is the day though, I got them done, and it’s a good thing, because today is the last day I can submit these projects for the Cricut Design Space Star contest. That is part of the reason why I put all these together! This is my next entry into the contest. 🙂 The theme for this round was Holiday Home Decor and Gift Ideas, and my group picked Black and White for the group theme. I thought it would be easy to come up with what I wanted to do, but it was more tricky than I thought, and I learned that I really like color!! 🙂 I do love the way that this all came together though. Let me show you how I did it. Some of the links shared in the post are affiliate links. 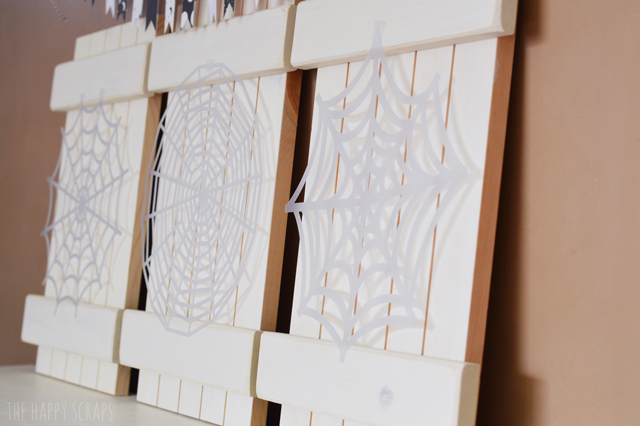 The very first thing that I did, was cut out these spider webs. 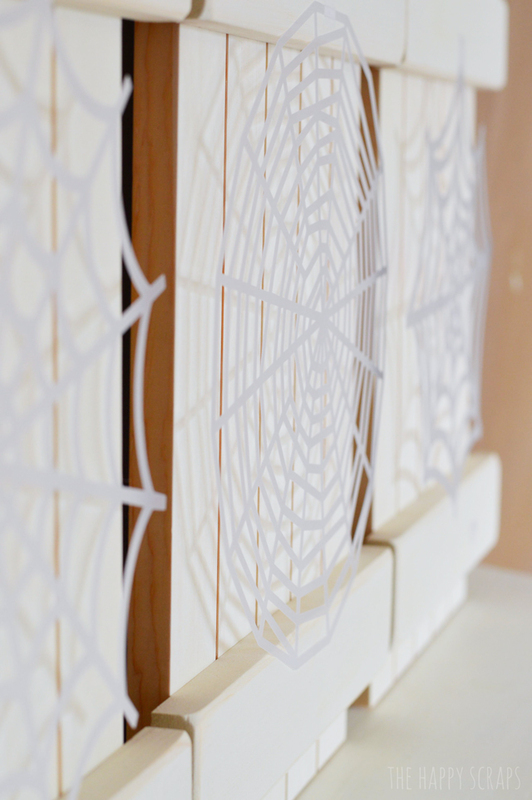 These are made from Quilting Template Plastic. I set my Cricut Explore to cut Stencil, and it cut these pretty good. If I did it again, I would double cut each one, just to make sure they were cut all the way through. I love the way they turned out. My boys think they are awesome as well! 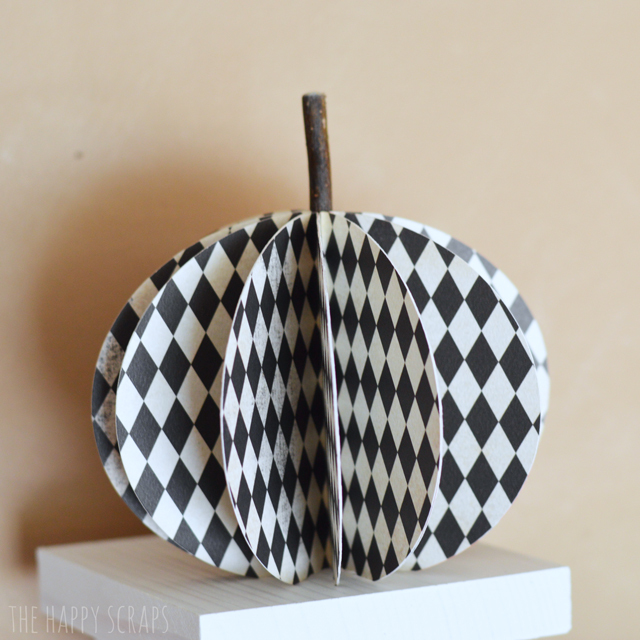 For this fun paper pumpkin, I cut out some Ovals on the Cricut Explore, and folded them down the center. I wish I would have realized sooner that the bottom needed to be flat, I ended up having to cut some off the bottom to make the pumpkin sit flat. 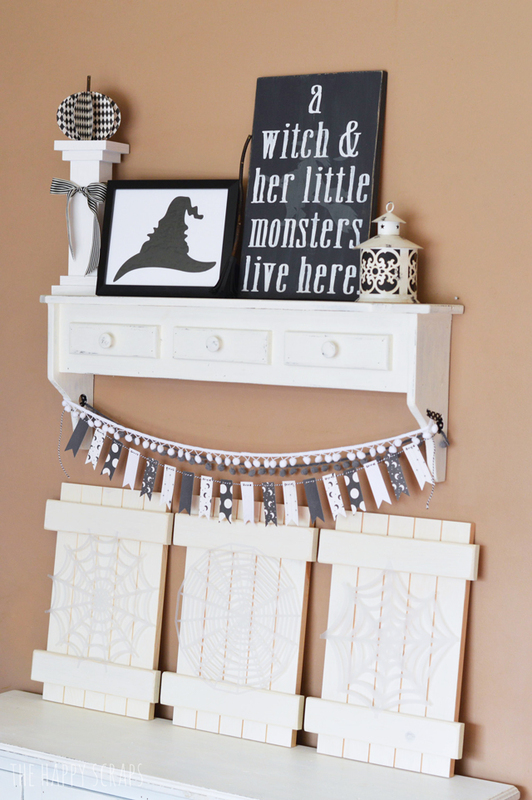 I would have just cut it that way with the Cricut, had I realized. I also would have scored the middle of the pumpkins. It all worked out in the end though. Once I had the papers all glued together, I used a small twig for the stem. 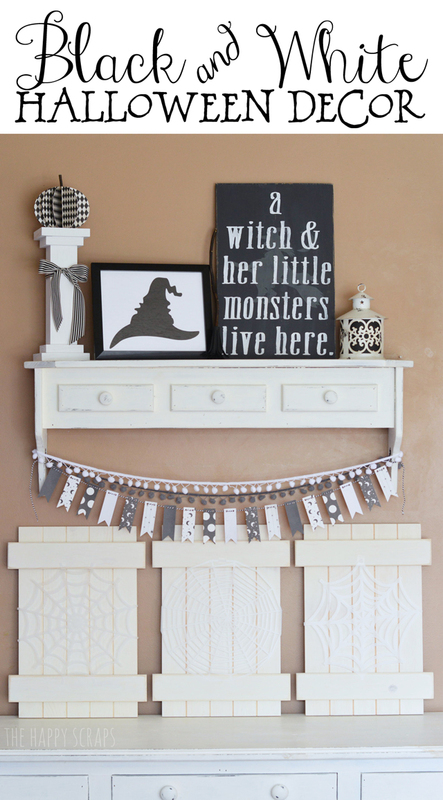 I set it up on a pillar with a black and white bow. 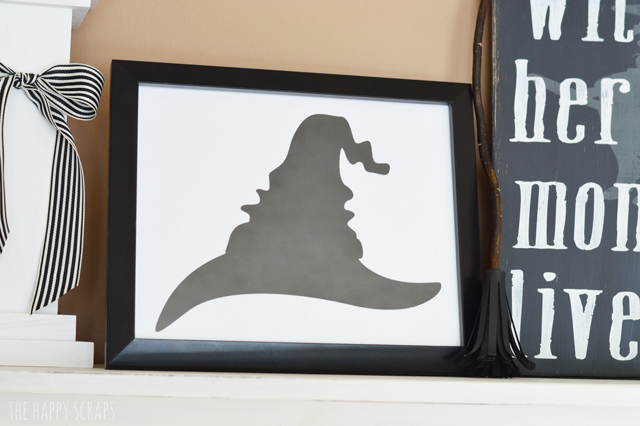 Using black cardstock and the Cricut Explore, I cut out a witch hat and backed it with white cardstock and put it in a frame. So simple, but I kind of like the way it turned out. This little broom was my favorite part of the whole thing to make!! I couldn’t find a design that I was picturing to cut for the bottom of the broom, so, I headed into Photoshop Elements and I designed a simple graphic out of a rectangle and lines. 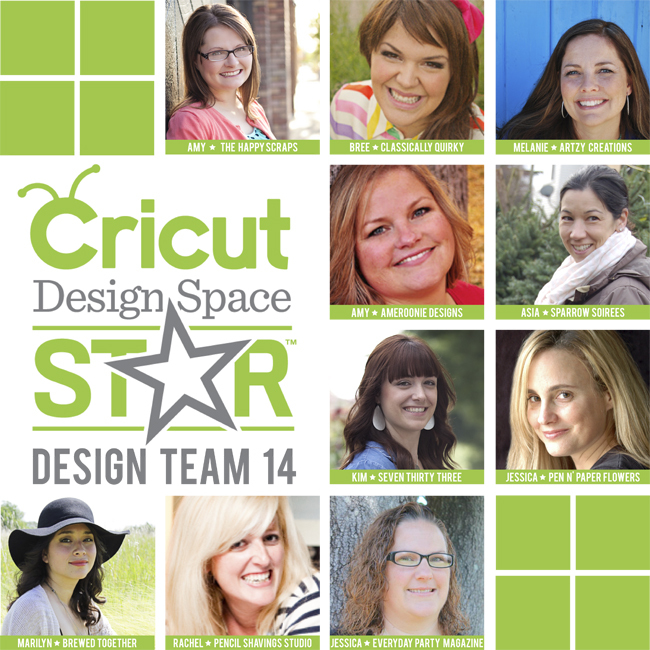 I uploaded it to Design Space, and IT CUT!!! Just like I wanted it to. I was SO excited! This is the first thing I have tried to create and cut all on my own, and while it is a very simple thing, I was excited about it. I just rolled it onto a twig while hot gluing it to it. Then I curled the cardstock out slightly. This sign was a fun one to make! 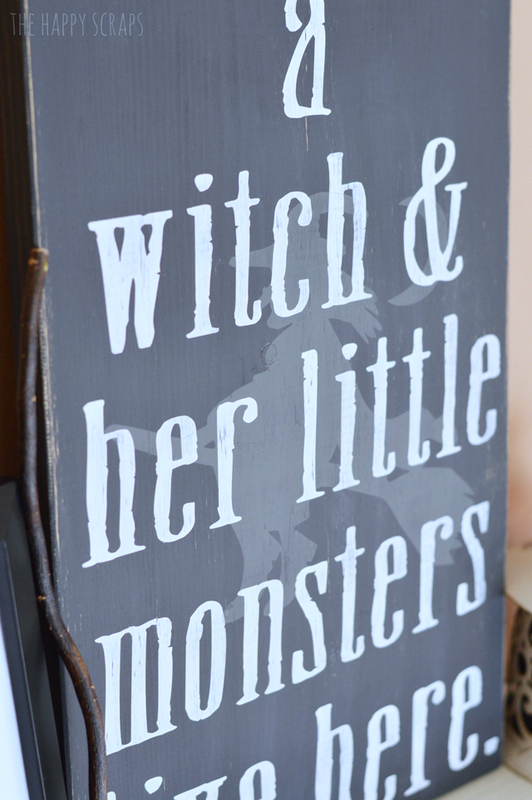 In Design Space, I found the flying Witch and I used the Stamped (shorty) font for the lettering. 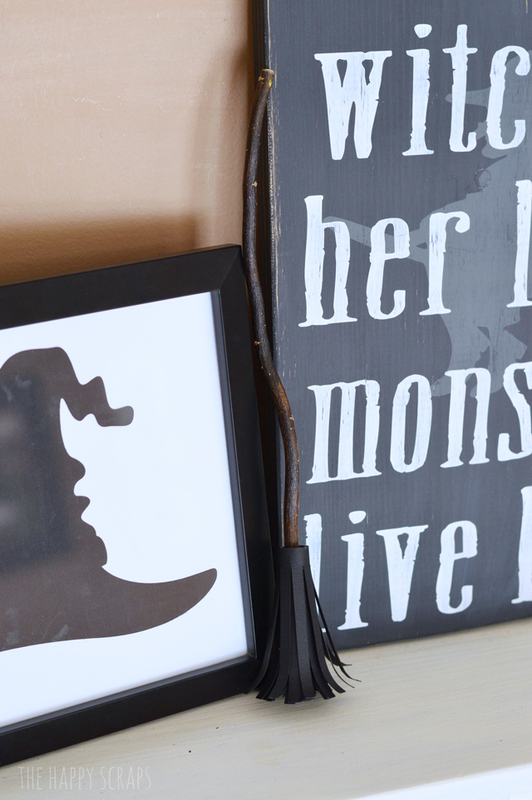 I cut both out of vinyl and used them as stencils. Once I had it all painted, I slightly distressed the sign with a sanding block. 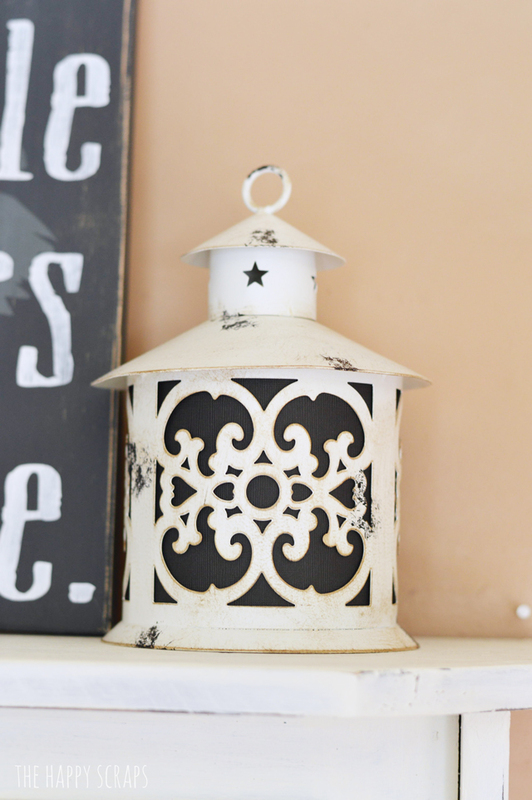 I had this lantern that I thought would go well with it, but I wanted to add some black to it. The bottom comes out to be able to put a candle up inside of it, so I cut a strip of cardstock, rolled it up, and slipped it up inside. It unrolled, and it worked perfectly. I really do love all that the Cricut Explore can do, and recently they announced that it has a new feature, PRINT THEN CUT!! I’m so excited about this feature. Although I haven’t tried it out yet, I am looking forward to it. I’ve heard it is amazing. SO, if you haven’t ordered your Cricut Explore yet, you better hurry and grab one. You won’t regret it, they are so much fun! My teammates have come up with some amazing projects as well. Head to their blogs to check them out. I love it Amy!! 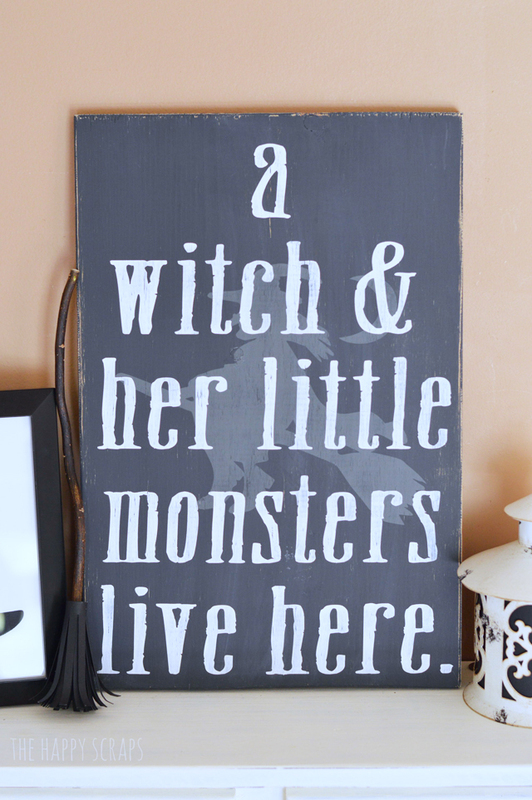 and I love that the witch is such a subtle element to the word art! Amy I just LOVE this!